Donald's prolific career as leading duck marches on with more of his solo-starring shorts. In this collection, we follow our hot-headed hero's escapades from 1947 through 1950 as he continues to endear himself to people all over the globe. 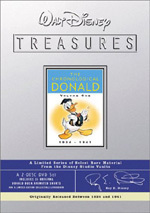 Among the treasure trove of gems in this volume are three of Donald's Academy Award-nominated Best Shorts - "Chip an' Dale" (1947), "Tea for Two Hundred" (1948) and "Toy Tinkers" (1949); the outstanding "Donald's Dilemma" from 1947; and a brand-new retrospective of the cranky quack-up's complete movie career, "The Many Faces of Donald Duck". It's no wonder his webbed feet are immortalized in cement at Grauman's Chinese Theater. Featuring exclusive introductions by film historian Leonard Maltin, this is a timeless collection from generations past for generations to come. While Mickey Mouse may have been the studio’s most famous character, Donald Duck proved a bigger draw as time passed. That meant he starred in more shorts than his rodent friend – or any other Disney character – ever did. Which is why we’re up to the third volume of Donald shorts on DVD. 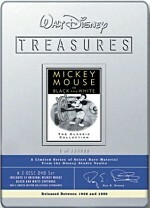 Mickey got three releases of his own, but that’s where the story ended, while Donald will require more discs to finish off his cartoons. 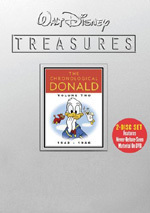 The process continues with a new two-DVD set called The Chronological Donald, Volume Three. As you might expect, this one picks up where Volume Two ended. It presents 25 shorts that span a period of only four years. We start with 1947’s “Straight Shooters” and progress through 1950’s “Out On a Limb”. For each short, I’ll offer the following information: the year in which it was produced and its director. I’ll also provide a quick synopsis of the cartoon plus my number grade for each one done on a scale of 1 to 10. Straight Shooters (1947, Jack Hannah): Donald runs a crooked carnival game and butts head with Huey, Dewey and Louie. This one works best when it concentrates on the shenanigans at the shooting gallery. Unfortunately, it takes a detour after a few minutes, one that proves less satisfying. 6/10. Sleepy Time Donald (1947, Jack Kinney): When Donald sleepwalks, Daisy plays along so she won’t disturb him. This means he takes her on an unconscious date. Even while asleep, Donald provokes laughs. Among other elements, the sight of him with a boot for a hat and the odd ability to defy gravity makes this a strong short. It’s got more than a few amusing moments and turns into another winner. 8/10. Donald’s Dilemma (1947, Jack King): A planter hits Donald on the head and causes trauma that makes the Duck believe he’s a great singer. After that he constantly croons and turns into a diva. A weird story that focuses on Daisy’s sadness after Donald becomes a star, this one takes some strange twists and veers from the Duck’s usual irascible character. Heck, Daisy even threatens suicide at one point! It’s consistently interesting and amusing. 8/10. Crazy with the Heat (1947, Bob Carlson): Stranded during a road trip, Donald and Goofy find themselves stuck in the desert. It seems odd that this one ends up in a Donald set; Goofy gets as much – if not more – screen time than the Duck, so it also would’ve been a logical addition to The Complete Goofy. Whatever the case, it becomes a decent adventure. Not a lot of laughs result, but it entertains to a reasonable degree. 6/10. Inconsistency alert: with a bloodthirsty Arab on display, shouldn’t this one be found in the “From the Vault” area? I don’t care for that form of self-segregation, but if Disney wants to be PC, at least do so in an internally logical manner. Other cartoons have been relegated to “The Vault” for less potentially offensive subjects. Bootle Beetle (1947, Jack Hannah): we meet a rare form of beetle that runs into Donald, a naturist who seeks to acquire a specimen of that insect. Despite the variation in species, Bootle reminds me an awful lot of Jiminy Cricket. He looks a lot like Pinocchio’s conscience, and he even sound and acts like Jiminy! More cute than funny, “Bootle” rarely excels. However, it comes with a clever conclusion that helps redeem its minor flaws. 6/10. Wide Open Spaces (1947, Jack King): While on the road, Donald tries in vain to get a good night’s sleep. “Spaces” takes a simple premise and runs with it. The short presents a series of clever sight gags and makes the most of its thin concept. 8/10. Chip an’ Dale (1947, Jack Hannah): Donald Duck displaces the chipmunks from their home when he cuts down a little tree. They attempt to reclaim their property. “Chip” doesn’t mark the pair’s first appearance, but it does show the duo in an early state. They bring out the worst in the Duck, which means fun. 7/10. Drip Dippy Donald (1948, Jack King): A leaky faucet and other distractions torment Donald as he attempts to sleep. Didn’t we just do this theme in “Wide Open Spaces”? “Drip” offers essentially the same tale redone with different nuisances. It still amuses, but it loses some points for a lack of originality. 6/10. Daddy Duck (1948, Jack Hannah): Donald adopts a baby kangaroo and contends with that critter’s wild antics. Man, Donald turns on his new friend awfully quickly; he seems to dislike the kangaroo within minutes of getting him home. The comedy of “Daddy” works okay, though the premise is too stupid to make sense to me; couldn’t the writers find a better reason to pair Donald with a kangaroo? As it stands, he seems unsympathetic when the hopper annoys him; after all, he eagerly took on the responsibility. Yeah, I know it’s silly to expect great logic from a cartoon, but the idiocy of the premise bugs me here. 4/10. Donald’s Dream Voice (1948, Jack King): Donald tries to sell brushes door to door but fails due to his poor diction. He takes “Ajax Voice Pills” to improve his speech and suddenly becomes a changed man. The short features a rather cheap concept but it uses it well. It milks the premise for all it’s worth and provides more than a smattering of funny scenes. 7/10. The Trial of Donald Duck (1948, Jack King): Donald finds himself in court when he can’t pay a restaurant bill. If nothing else, I’ll give “Trial” credit as something different. It takes a weird view of Donald’s actions, as it makes him the victim even after he enters the restaurant without the means to pay. I get the feeling someone at Disney had an axe to grind with pricey French restaurants and this was the result. 5/10. Inferior Decorator (1948, Jack Hannah): When Donald’s flower-covered wallpaper attracts the attention of a confused bee, the Duck taunts the insect. However, the bee eventually gets back at Donald. “Decorator” has its moments, but I don’t much like the cutesy bee. Maybe he just reminds me too much of that Honey Nut Cheerios bee, but he’s a little too heavy on the adorable side and gets on my nerves. 5/10. Soup’s On (1948, Jack Hannah): Donald deprives his nephews of dinner when they fail to follow his rules. Though Donald often comes across as sadistic in his dealings with H, D & L, here he seems more sympathetic. After all, he simply wants the kids to wash off their filth before dinner. That factor makes this one less fun than normal because we almost feel bad for Donald as the nephews torment him. Donald works better as the aggressor, not as the victim. However, a clever bit toward the end when the boys convince Donald that he’s dead helps redeem this one. 7/10. Sea Salts (1949, Jack King): This piece reunites Donald with Bootle Beetle. The two get shipwrecked and compete with each other for survival supplies. Somehow they manage to remain friends even as Donald tries to use Bootle as bait. Salts offers a mediocre short. 5/10. Winter Storage (1949, Jack Hannah): While Donald tries to plant acorns in a forest, Chip an’ Dale do their best to steal the nuts for their own consumption. Frankly, “Storage” belongs on a C&D compilation more than it does here. Donald really plays a supporting role, as the rodents come to the forefront. It’s still a fairly amusing cartoon, however, as it takes a standard theme and boasts some good sight gags. 7/10. Honey Harvester (1949, Jack Hannah): That Honey Nut Cheerios-style bee returns as he attempts to defend his honey from Donald’s attempts to purloin it. The unnamed bee remains an uninspiring character; I can see why he only made a few appearances, as he just doesn’t offer much to make him interesting. His presence dooms “Honey” to become a pretty lackluster short. 5/10. All In a Nutshell (1949, Jack Hannah): If that title leads you to expect another Chip an’ Dale cartoon, pat yourself on the back! Donald runs a nut butter company and the chipmunks steal his inventory. Not exactly an inspiring story, is it? However, I like the twist it takes when C&D attempt to make off with Donald’s nut-shaped store; that adds a curveball that allows “Nutshell” to become something more than just a remake of “Storage” and the like. It also implies that the rodents kill Donald ay the end! Such a dark twist must count for something. 7/10. The Greener Yard (1949, Jack Hannah): We get another flashback morality tale from Bootle Beetle as he tells of the time he tried to steal from Donald’s lush garden. If Disney wanted to feature a Jiminy Crickett-style character, why not just use Jiminy Crickett? Bootle continues to feel like a poor substitute, and “Yard” goes nowhere fast. 3/10. Slide, Donald, Slide (1949, Jack Hannah): That unnamed bee wants to listen to classical music on Donald’s radio, but the Duck prefers to follow the World Series. The two battle over control of the radio. Perhaps a more interesting foe could make this one interesting, but man, I really don’t care for that stupid bee! His presence means that this one never excels. 4/10. Toy Tinkers (1949, Jack Hannah: Chip an’ Dale attempt to retrieve their nuts from Donald’s house. This leads to a battle waged with toys. Unusually violent for a Disney cartoon, this one becomes pretty lively. It’s creative and clever. 8/10. Lion Around (1950, Jack Hannah): Huey, Dewey and Louie dress up as a lion to scare Donald – and steal a pie he bakes. Man, that’s a heck of an expressive costume the nephews wear! That silliness aside, “Around” proves reasonably fulfilling. It gives us a twist to the usual antagonism between Donald and the boys, and some good laughs come along the way – even when a real lion makes an inevitable and predictable appearance. 7/10. Crazy Over Daisy (1949, Jack Hannah): Set in the early 20th century, Donald tries to take Daisy on a date but Chip an’ Dale conspire to mock and stop him. The short doesn’t quite make it clear why they’re so anxious to mess with Donald, but the results offer amusement nonetheless. They do put Donald in the odd position of being a sympathetic character – C&D seem awfully sadistic – and this turns into a mostly fun short. 7/10. Trailer Horn (1950, Jack Hannah): Chip an’ Dale discover mysterious footprints and track them to a mobile home operated by Donald Duck. As usual, they irritate him. The chipmunks often provided good foils for Donald, and that proves true here. Nothing genuinely inspired occurs, but the scenario offers enough humor to satisfy. 6/10. Hook, Lion and Sinker (1950, Jack Hannah): The lion from a few shorts back returns along with a cub. When the elder feline fails to catch fish, they attempt to purloin Donald’s haul. This short features the most bizarre sense of proportion. When the cub trots home with a fish, it fits neatly into his mouth. However, when the much larger lion handles it, the fish suddenly becomes the same size as the adult cat! Strange proportions or not, this is a decent cartoon. The lions are acceptable antagonists; they lack the character of C&D or the nephews, but they’re much better than Bootle or the bee, at least. 6/10. Out on a Limb (1950, Jack Hannah): Donald trims trees and taunts Chip an’ Dale. Unusually, Donald gets the better of the chipmunks more often than the reverse, as he really sticks it to them for a while. Of course, the situation inevitably switches, and all of this creates a pretty lively short. 7/10. 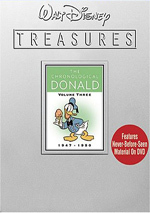 The Chronological Donald, Volume Three appears in an aspect ratio of 1.33:1 on these single-sided, double-layered DVDs; due to those dimensions, the image has not been enhanced for 16X9 televisions. While the first volume of Chronologicl Donald shorts offered very good visuals, V2 took a dive and was much less satisfying. Although V3 didn’t quite live up to the standards of V1, it came much closer than did the erratic V2. The main concern stemmed from source flaws. Given the age of these shorts, they didn’t suffer from a surfeit of problems, but I thought they were a little dirtier than what I expect from Disney. The studio has spoiled us with excellent transfers, and these could be a bit messy at times. I noticed various examples of dust and specks through many of the shorts. “Crazy with the Heat” and “The Trial of Donald Duck” were probably the worst culprits, though they weren’t the only examples. Again, the cartoons usually looked pretty clean, but I thought they could improve to a minor degree. Some mild sharpness issues also occurred, but these were fairly negligible. The majority of the shorts displayed good delineation and accuracy, as softness was vague and infrequent. No issues with jagged edges or shimmering occurred, and edge enhancement remained minor. Colors stood out as a consistent strength. With V2, I thought some of the shorts were dingy and flat, but that never occurred here. The hues always seemed lively and dynamic. Blacks were deep and dense, while shadows showed good clarity. I debated whether or not this set deserved a “B+”. I went with the “B” mostly due to the mild source flaws and the occasional softness, but overall, the shorts looked quite good. As for the monaural audio of The Chronological Donald, it remained perfectly acceptable, if unexceptional. Actually, I thought it improved a bit compared to prior sets. Speech showed growth, as the mild edginess of the past no longer marred the lines. Of course, with Donald, it could be hard to really evaluate dialogue, but I thought the various speech elements were a little more natural than in the past. Music and effects stayed clean but without much life. That didn’t surprise me, as I don’t expect great range from 50-year-old cartoons. The scores were acceptably concise, and effects seemed clear across the board. Nothing stood out as memorable, but at least no problems with distortion or background noise marred the presentation. Curving for age, the audio merited a “B”. Clown of the Jungle (1947, Jack Hannah): Donald goes on a South American bird-photographing expedition but an annoying Aracuan constantly ruins his efforts. Am I the only one who thinks it’s odd to see a duck go on a bird-watching trip? Well, Disney cartoons always walked a weird line between anthropomorphized animals and more literal ones – after all, Goofy and Pluto were both dogs – so I won’t take too much offense at the strange quest. The Aracuan does make for one of Donald’s more annoying foes, and his antics contrast well with our ever-irascible protagonist. 8/10. Why is this one controversial? I guess because the Aracuan threatens suicide a few times. I don’t see any sticky ethnic stereotypes here, though, and it seems weird that the potential self-injury puts this one in “The Vault” since “Donald’s Dilemma” also features a suicidal Daisy Duck. Three for Breakfast (1948, Jack Hannah): When Donald makes pancakes, Chip an’ Dale go to elaborate measures to steal them. C&D never did a lot for me, though they do function as pretty good foils for Donald. Those three may be cartoondom’s least intelligible characters, though – thank God for DVD subtitles! The short offers decent entertainment but doesn’t stand out as remarkable. 6/10. What puts this one in “The Vault”? Some Asian stereotyping at the very end dooms it. Tea for Two Hundred (1948, Jack Hannah): Donald deals with ants who try to steal his picnic basket full of food. For once, Donald actually appears to deserve his comeuppance. He tortures the first ant and creates his own circumstance. The short doesn’t fully utilize all its scenarios, but it amuses. 7/10. Why does this one end up segregated? It depicts ants as stereotypical African tribesmen. Under “Bonus Features”, we discover three pieces. The Many Faces of Donald Duck lasts 14 minutes, 41 seconds as it presents remarks from Maltin, animation historian Jerry Beck, animator/voice artist Tony Anselmo, and animator/animation historian Mark Kausler. They chat about some of Donald’s appearances over the years. I thought “Faces” would look at the way the character changed – both visually and otherwise – through the decades, but instead it essentially just discusses his popularity and some of his appearances. A few insights pop up, but honestly, it feels more like a long ad than anything else. Donald Duck on The Mickey Mouse Club runs a whopping 23 seconds. Or maybe not – that 23-second clip actually just gives us an intro from Leonard Maltin. He tells us that we can find 10 Donald-centric MMC openings scattered across the two DVDs as Easter eggs. Which you can, but which you shouldn’t have to do that. It’s irritating that they made these clips a nuisance to find. DVD One also gives us some Galleries. These present 156 stills that cover 15 shorts. They offer concept art, backgrounds and other visual elements connected to the cartoons. The interface gets a little clumsy at times – mostly because it lumps the shorts into three groups of five – but there’s a lot of quality material to be found here. Expect the usual Leonard Maltin Introductions here. On DVD One, he gives us a two-minute and 16-second chat that provides an overview of what we’ll find on this disc. Maltin also provides a 28-second intro to the “controversial” shorts found in “From the Vault”. Donald’s Happy Birthday (1949, Jack Hannah): The nephews try to get the money to buy Unca Donald a present. This one functions as some sort of weird morality tale, though I’m not sure what point it serves. Donald tries to do the right thing throughout the short – he teaches the kids to save money and not to smoke – but he’s still supposed to be the bad guy. It’s a weird take on things, and that strangeness makes it less effective. 5/10. What lands this one in “The Vault”? The scene in which the nephews have to smoke the cigars does the trick. Boy, that’s a pretty weak reason to deem the short controversial. I hate smoking as much as anyone, but it depresses me that the anti-smoking fervor somehow makes the sight of cartoon ducks smoking cigars an offense. If anything, this one should be shown to kids to depict the nastiness of smoking; it’s not like the nephews enjoy their stogies! Bee at the Beach (1950, Jack Hannah): Donald’s seemingly selfish actions cheese off a beach-going bee. Yes, we get the same cutesy buzzer from “Inferior Decorator”, though he displays more venom here; he actively tries to cause Donald’s demise! I still don’t like the character, but the short works fairly well. 7/10. I must admit I have absolutely no idea what aspect of “Beach” makes it controversial and a “Vault” entry. Maybe the Shark Anti-Defamation League complained about their depiction as man-eating beasts? Otherwise I find nothing un-PC or otherwise potentially offensive; I’m really at a loss to explain what problem someone could have with this one. Update: I read on the Home Theater Forum that allegedly some took offense at the depiction of sharks here. They thought they were supposed to be Jewish due to their large snouts and the “loan shark” connotations. If this is true, I think it’s about the dumbest thing I’ve ever heard. For one, I’ve never thought of loan sharks as being Jewish; that’s more of an Italian-American stereotype, isn’t it? And as for the large snouts – that’s what sharks have! Again, I have no proof that this really is the reason “Beach” is in the vault, but if it’s true, it sets a ludicrous new standard for political correctness. Yes, you’ll find more Leonard Maltin Introductions here. He gives us a one-minute and 54-second lead-in to DVD Two as well as the same 28-second preface for the “From the Vault” shorts found on DVD One. The main intro tells us a little about Donald’s co-stars. Sculpting Donald lasts nine minutes and eight seconds. Maltin chats with maquette artist Ruben Procopio as we learn how he creates three-dimensional sculptures of two-dimensional characters like Donald. Maquettes are often an important aspect of animation that fail to get much discussion, so it’s good to learn a little more about them. More Galleries appear here. These act the same as those on DVD One, as they cover 14 shorts across 177 frames. Expect more good content here. Finally, the DVD’s booklet includes a short text overview from Maltin as well as some archival images. An insert card also displays a reproduction of the poster for “Inferior Decorator”. Now that we’re up to our third two-DVD set of Donald Duck cartoons, you might worry that the title character has run out of steam. Perhaps that’ll occur with V4, but Volume Three of The Chronological Donald presents plenty of fun shorts. Of course, some work better than others, but very few actual duds materialize here. The package provides pretty good picture and audio along with some passable extras. The lack of substantial supplements disappoints, but there’s enough entertainment in the cartoons themselves to earn my recommendation.